We’ve all faced this issue of what to do with that employee – the trustworthy finance guy, who upsets your team members often over trivial amounts; the brilliant technologist who cheeses everybody off with his superior attitude, or the HR manager, who despite the many years she’s been with you, who’s not pulling her weight any more. The timing is rarely right to confront them and the longer you put it off the worse it’s likely to get. We also worry about how we got here and how best to handle it so we retain them without too high an emotional cost. If you are like me, then you put it off for a better time, which rarely comes. 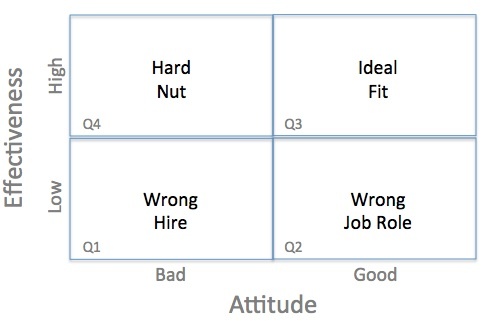 Quadrant 2 – Have the right attitude but are not effective Usually this is a sign that these folks are in the wrong job. They may have been effective, even in the same job, but no longer are, because the jobs requirements have evolved or they haven’t. Or you’ve placed them in the wrong role. The ineffective sales guy may bloom in a business development role or inside sales job. The trick is to find them a role that they can be effective in. If your organisation is big enough, you may have one or more such roles – sometimes the right role may not be within your department or even company, in which case its best to help them find the right role, whether inside or outside your company. 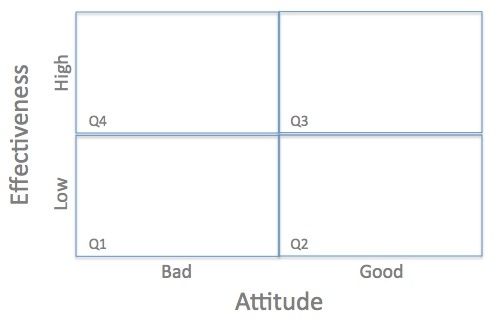 I’ve found talking about the four quadrants and even mutually agreeing with your team members where they see themselves and where their peers or you see them helps immensely. This way when it is time to have the hard conversation, you both have a framework and vocabulary that can help keep the conversation professional. In my experience, almost always folks in the Quadrant 4 will have to be let go. We’ve had the occasional technical person build out their interpersonal skills and make the move from Quadrant 4 to Quadrant 3.